When conspiracy theorists and not-so-super sleuths the Lone Gunmen (Langley, Frohike and Byers) receive an encrypted file from C.E.R.N. (the large hadron collider) containing nothing but tabloid headlines, they decide to investigate the mystery. The articles include supposed ghost-exterminators from New York City, reports of “manphibians” lurking about in the night, photos of robotic aliens that can change shape, and something called Skylogic Systems which doesn’t come up on any Google searches. Even weirder, each paper is post dated from the future. The Lone Gunmen take their findings to FBI Agents Mulder and Scully, who reveal that some of the articles about a killer virus tie into a murder scene they’ve been investigating. Not long afterward, the Gunmen are attacked by ACTUAL gunmen (wearing business suits), who don’t like them poking around. 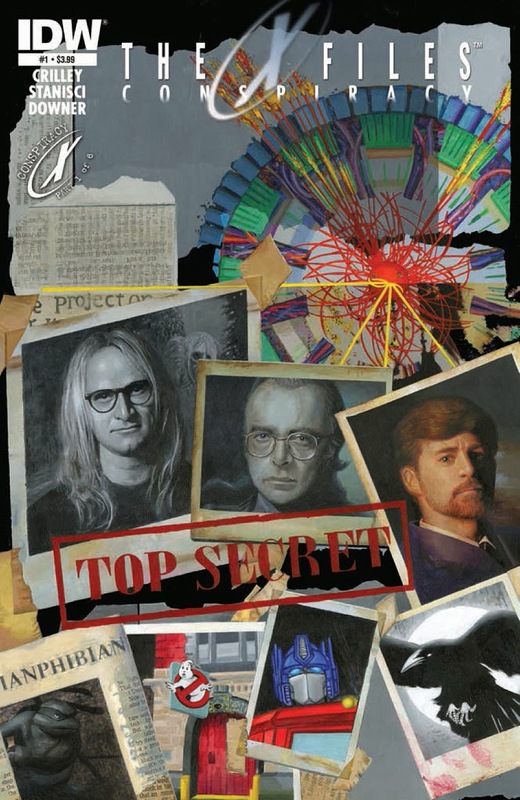 The Lone Gunmen go on the run, deciding to dig deeper into the conspiracy. *For the Turtles, the story continues in The X-Files/TMNT: Conspiracy #1. *The X-Files: Conspiracy is a 6-issue crossover event linking together several of IDW’s licensed comic books with the X-Files. Titles involved include Ghostbusters, TMNT, Transformers and The Crow (to be read in that order). The one-shot tie-ins are bookended by a 2-issue miniseries, but the one-shots can never-the-less be read as standalones. *This issue was originally published with 7 variant covers: Standard Cover by Miran Kim, RI Cover by Joe Corroney, Brian Miller and Hi-Fi Studios, RE Cover Hastings Exclusive by Carlos Valenzuela, and 4 glow-in-the-dark covers by Andrew Currie and Downer each featuring one of the four tie-in properties. The annual IDW licensed property crossover is upon us! Though the Ninja Turtles participated in 2012’s “Infestation 2” event, they skipped 2013’s “Mars Attacks” get-together (but that’s okay, because they'd already met the Martians in a “Mars Attacks” miniseries from the ‘90s). For the sake of reminding everyone, IDW doesn’t handle its crossover/tie-in events the same way Marvel and DC does. Each tie-in is wholly standalone and collecting the other titles to get the “bigger picture” is strictly optional. I appreciate their consideration for my budget. So far as this first issue in the bookending “Conspiracy” miniseries is concerned, Leonardo only appears in the splash page as a photo on one of the tabloids. Unless you’re out to snag every last one-panel appearance of the Ninja Turtles, you can skip this comic without any fuss. The Crow? Are you sure? 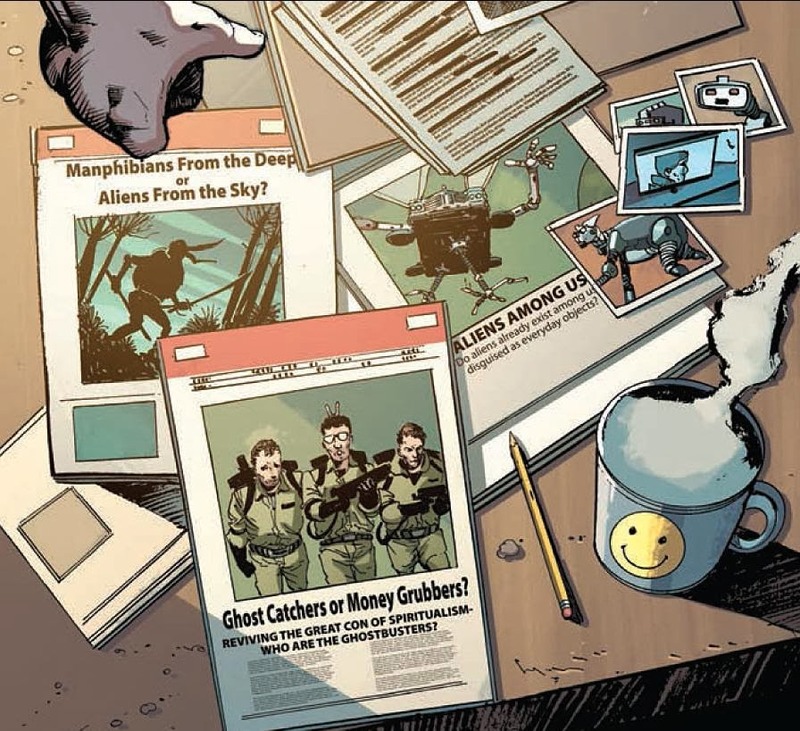 As I recall, IDW's current X-Files series, specifically issue #2, explains the Lone Gunmen's return: they fake their deaths, more or less. I haven't read the issue in a while, so if anyone wants to re-inform me on any particulars, please do. I'm glad, as killing them off in the TV series was, frankly, a stupid decision, anyway. The inside cover says "The Crow" is one of the 4 properties crossing over. Personally, I've never seen any of the movies and no nothing about the Crow, so I'm just repeating what I read in the Comic Book Resources preview. "Faked their deaths". Good enough for me! Saves me a Wikipedia binge.